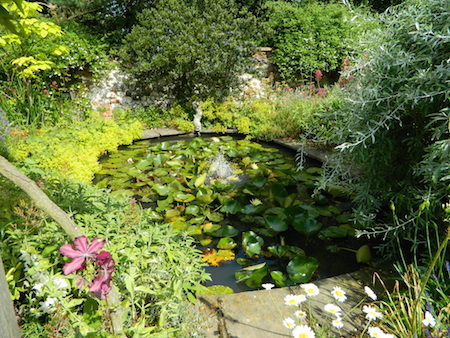 Holme-next-the-Sea (near Hunstanton) will be presenting its annual Open Gardens Day on Sunday July 7th 2019 from 11 a.m. until 5.30 p.m when about ten gardens will be open to the public. Refreshments will be served all day in the Village Hall and the ever-popular plant stall will be at Berkeley House. 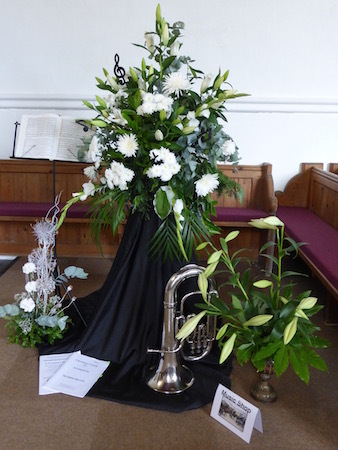 There will be a display of floral arrangements in St. Mary's Church. A number of the gardens will feature stalls including books, tombola, wine and whisky galore and homemade chutney and jams. Tickets for the raffle can be purchased at the Village Hall. A "Garden Passport" will cost £4.00 and will provide admission to every open garden and features an easy-to-follow map to find your way around. Children get in free - and parking is also free! 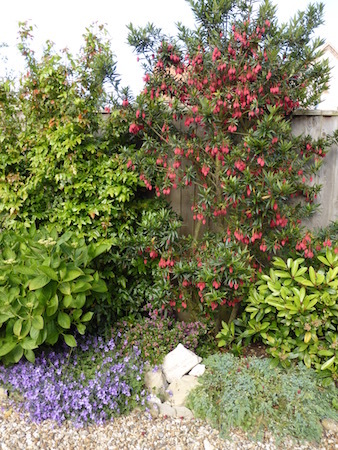 July 7th 2019 - Holme-next-the-Sea Open Gardens - Must be there! 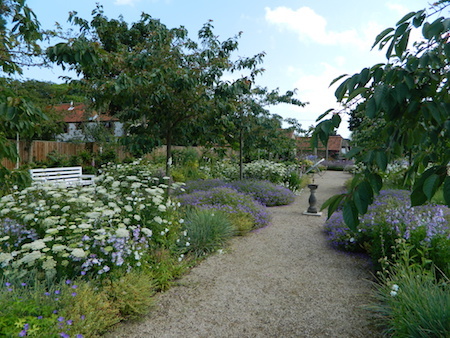 The village's annual Open Gardens day has, deservedly, become one of the most popular events of its kind in north west Norfolk. 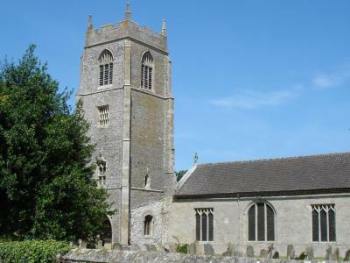 The Help Holme Church Group manages the day under the direction of the current organiser, Ann Rossington, together with the help of a large team of 'workers' most of whom live in the village. We are most fortunate that there are also others from further afield who freely give of their time and assist with a variety of jobs all of which are vital to the smooth running of the event. The shuttle bus was once again very popular ferrying visitors around the gardens. The bus was kindly loaned by The Glebe House School, Hunstanton. 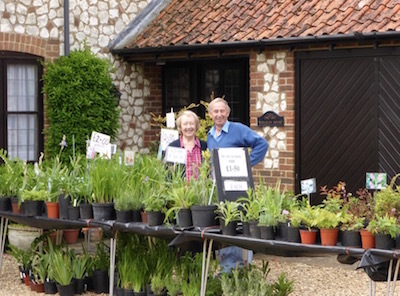 The Plant Stall at Berkeley House is a regular feature of Open Gardens day with many visitors returning each year. There is always a wide selection of plants to choose from - and very competitively priced. If you call in early any plants purchased can be held until you leave. All part of the service! Refreshments are served throughout the day in the Village Hall on Kirkgate. There is always a wide selection of main salad courses, a variety of puddings and, as you might expect, home made cakes also feature throughout the day. Many of the gardens host additional attractions - regular features include a display of tools and ideas to make gardening easier and a demonstration and talk about birds and moths. There are always Tombola and Book stalls to be found and home-made jams and chutneys to buy - and lots of prizes to be won in the raffle! ...and this arranger brought together flowers, music and and instrument to depict a Music Shop. All of the proceeds from the day are used by the Help Holme Church Group to help maintain the fabric of St. Mary's Church. Past projects funded by the group include the replacement	of the main south side windows, the replacement of the wall heaters and the provision of toilet and kitchenette facilities. 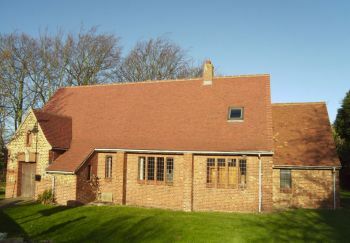 Most recently the Group has funded the underpinning and redecoration of the Vestry and the redecoration of the inner and outer porches and in 2014 the limewash finish to the whole of the interior or the church was re-painted. So why not come along for a super day out and, at the same time, help us to keep our Church in good order? The low admission fee entitles you to access all of the gardens on show and to view the floral displays in the Church. Safe parking is free and the shuttle bus service is included - and accompanied children get in for free too! We would like to take this opportunity to thank everyone who visited the village in previous years on Open Gardens Day. We enjoyed your company and very much looking forward to seeing you all again next year!